For the Later Tang dynasty county, see Fuchang County. For the general, see Fuqing (general). Fuqing (help·info) (Chinese: 福清; pinyin: Fúqīng; Wade–Giles: Fu2-ch'ing1; Pe̍h-ōe-jī: Hok-chhiaⁿ; Foochow Romanized: Hók-chiăng; also romanized as Hokchia) is a county-level city of Fuzhou in Fujian Province, People's Republic of China. 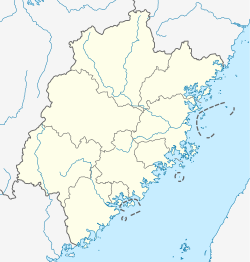 Fuqing is located in the north-central part of Fujian's sea coast, south of Fuzhou and north of Putian. It has a long indented coast line on the Taiwan Strait, to the south of Fuzhou. The northern part of the county-level city, including the city's central urban area, is in the valley of the Longjiang River. The southern part includes a number of peninsulas with highly indented coast. Fuqing is situated 45 kilometres (28 mi) to the south from Changle International Airport. This city nowadays grows as an industrial area, supported by a good infrastructure of Fuzhou–Quanzhou Highway, Fuzhou–Xiamen Railway (Fuqing Railway Station), and a port (Fuqing Port, 福清港) on the Taiwan Strait. Fuqing Nuclear Power Plant is under construction near Sanshan Town, on the southern coast of the county. Fuqing, as well as most of other Fujian, is known for its large number of emigrants, or huaqiao. The first wave of emigration  started in 1940s; most common destinations during that time were Indonesia, Singapore, and East Malaysia. Despite their humble beginnings, some of them managed to be the richest men in Southeast Asia, e.g. Sudono Salim (Salim Group), Mochtar Riady (Lippo Group), Hendra Rahardja, Rachman Halim (Gudang Garam), and Robert Kuok. Association: International Association of Fuqing, Perkumpulan Fuqing (Indonesia), and Singapore Futsing Association. Fuqing has its own dialect which is closely related to the Fuzhou dialect, although the two are mutually intelligible to quite a high extent. Since it is a hilly area where mountains used to isolate each village, there are many variations in the local dialects. Most of its people can also speak Mandarin, which is used in schools, businesses, and to communicate with people from different parts of the province. Songs sung in Fuqing dialect are available online. Fuqing is located in the coastal hills, subtropical climate, warm and rainy, but the river is short and shallow. Rich in species while not rich in harvest. Therefore, the important staple food in Fuqing is sweet potato. Non-staple food is dominated by various marine food. Many traditional snacks are made from sweet potato and seafood. Guangbing (光饼): Guangbing is a bread product that is baked and shaped like a sesame-seeded burger bun top. In the year of 1562, the Japanese invaded Fujian province. General Qi Jiguang was charged to drive the invaders out of Fujian. In order not to let the meal time slow down their marching speed, General Qi invented a kind of bread which was shaped into a ring at that time, so his soldiers could wear a string of those breads around their neck. After the victory, the recipe of this bread product was spread throughout the province and named Guangbing after General Qi. Nowadays, there is no longer a hole in the center of a Guangbing. Oyster Patties (海蛎饼):It is made of rice flour(pulp), soya bean powder (pulp), oyster, pork, cabbage and seaweed. It is a kind of fried snacks. Fish Ball (鱼丸）:It is a kind of ball-shaped food. Fish mince made from eels, mackerel or freshwater fish, and sweet potato flour mixure evenly to make its wrappers. The mince of pork or shrimp is inside. Sweet Potato Ball (番薯丸）:The wrapper is made of starch and sweet potato flour. The mince is made of oyster, seaweed and pork. It stands for the family reunion. Seaweed Cake (紫菜饼）:It is made of flour and seaweed by traditional way—Stone oven. Containing various vitamins and microelements that are necessary for humans. Coustoms and food:On the first day of the new year, people in Fuqing would eat Xianmian, which is a kind of extra-thin noodles and it means longevity. What’s more, two duck eggs are in the noodles. Because in the local language, the pronunciation of duck egg is similar to suppress chaos, it stands for safe and sound. On the second day of the new year, it is the day to visit and comfort the family that lost their family members last year. Thus, people cannot visit the family where nobody died last year in that day. Otherwise, the visit would be regarded as unlucky. The main customs include eating yuanxiao, dragon and lion dance, Shehuo, lantern riddles, stilt, boat, row, and waking on the li Bridge. The most important step is making the glutinous rice balls and, prepare the red-orange and ten pairs of chopsticks. The red-orange stands for blessing and ten pairs of chopsticks stand for family reunite. And lighting a pair of red candles, which means thriving. The essential part of the tomb sweeping should be to offer sacrifices that are often made from papers, and fire incense and the firecrackers in front of the tomb. After sweeping the tomb, people would take some pine branches or flowers back home in order to get good luck. Tjoa Ing Hwie (1925-1985), Indonesian businessman, billionaire. Founder of Gudang Garam tbk. Goi Seng Hui (1949-), Singapore Businessman, billionaire. Founder of Tee Yih Jia Group. Han Guolong (1955-), Chinese Businessman, billionaire. Founder of GuanCheng Group. Chen Longji (1956-), Chinese Businessman, billionaire. Investor. Lin Dingqiang (1965-), Chinese Businessman, billionaire. Owner of Jinhuichina. Kiki Barki (1956-), Indonesian Businessman, billionaire. Owner of Harum Energy. Liem Toeng Ki/Tukiman Salim (1925-1995), Indonesian Businessman, billionaire, former Owner of Suzuki Motor Indonesia. Liem Hariyanto Wijaya Sarwono (1929-), Indonesian Businessman, billionaire. Owner of Bumitama Agri. Ye Xianggao (1559–1627), Senior Grand Secretary of the Ming dynasty. Ingen Ryūki (1592–1673), founder of the Ōbaku school of Zen Buddhism in Japan. Wikimedia Commons has media related to Fuqing.